In providing a comprehensive investigation of alcohol, cigarette, and marijuana initiation among adolescents, the overarching goals of the research were to build upon extant findings, address important gaps found in the literature, and contribute to the prevention science knowledge base. 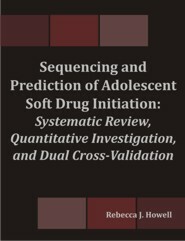 A four-fold purpose founded the study: 1) provide a systematic review of the soft drug initiation literature; 2) test a modified version of Kandel's (2002) drug sequencing hypothesis; 3) determine if predictors of soft drug initiation differ in kind or saliency by biological age and drug type; and 4) examine age- and drug- specific determinants of the timing at which soft drug initiation occurs. Supplemental attention also was directed at evaluating the utility of Petraitis et al. 's (1995) distal-proximal mediation hypothesis. Through the quantitative component of the research, nine hypotheses were tested. Cross-sectional data were derived from a rural sample of 6th, 9th, and 12th grade students who completed the 2004 Primary Prevention Awareness, Attitude, and Use Survey (PPAAUS). All of the hypotheses obtained some degree of support; more support was yielded for the specific risk factor hypothesis than the common factor model, and convincing evidence was obtained for Kandel's drug sequencing hypothesis and Petraitis et al. 's distal-proximal mediation hypothesis. The findings also supported the bulk of the directional hypotheses and several of the direct and indirect effects propositions put forth in social learning theory, the social development model, and the theory of planned behavior. In contrast, the results called into question some of the direct effects articulated in Hirschi's original statement of social control and underscored some possible limits of the social development model. In an effort to gauge the validity of the findings, a dual cross-validation scheme was employed. The systematic review cross-validation involved comparing the quantitative findings for two major hypotheses to those yielded from 36 primary studies examined in the systematic review. Through a further quantitative cross-validation, the findings for the major and supplemental hypotheses were compared to those derived from a sample of 6th, 9th and 12th grade students who completed the 2001 PPAAUS. On balance, a relatively strong degree of convergence was obtained. This confluence served to bolster the reliability and validity of the results. Policy and programmatic implications also were indicated. Rebecca J. Howell is an Assistant Professor in the Department of Criminal Justice at the University of Alabama. She earned her Ph.D. in Criminology from Indiana University of Pennsylvania. She has conducted research and published in the areas of drug initiation, juvenile delinquency, criminological theory, juvenile justice, and corrections. Her previous work has appeared in a number of journal outlets, including Youth Violence and Juvenile Justice, The Prison Journal, Deviant Behavior, and Criminal Justice Studies. Rebecca currently is testing stage theory with longitudinal data from the Mobile Youth Survey and conducting two pedagogical outcome evaluations.